Welcome to today's edition of TC Daily, your favourite roundup of technology around Africa. If you haven't, please take a moment to subscribe so you have this delivered directly to your mailbox. Kwese Free TV has become the first free-to-air terrestrial broadcaster in South Africa to be licensed since e.tv received its terrestrial television licence 21 years ago. Of the five entities vying for the license, Independent Communications Authority of South Africa named Kwese Free TV as the successful applicant at a press conference in Pretoria yesterday. Techcentral has more. STOA Infra and Energy announced it has acquired a strategic equity interest in Metro Fibre Networx in South Africa. The company purchased a 23.08% stake in Metro Fibre from a portion of its capital base earmarked for investments in telecommunications in developing countries. The UK Government, through InfraCo Africa, a Private Infrastructure Development Group (PIDG) company, is investing Ksh. 220 million (~US$2.2m) in the development of two solar plants in rural Kenya. At an event in London, the UK’s Minister for Africa, Harriett Baldwin, announced the commitment by InfraCo Africa to develop two solar plants in Samburu and Transmara, each with a capacity of 10 MWAC, to give more people access to affordable, clean energy. The Africa Women Innovation and Entrepreneurship Forum (AWIEF) has opened a call for nominations for the 2019 AWIEF Awards. Nominations for the awards are open across eight categories that include the Tech Entrepreneur Award, Young Entrepreneur Awards, and the Social Entrepreneur Award. The deadline for nominations is 15 May. This year’s awards will take place during the annual Africa Women Innovation and Entrepreneurship conference and exhibition which will be held on 29 and 30 October in Cape Town. Starfleet Accelerator by æternity Ventures has selected Kenyan agri-finance startup CapAgri as one of the 14 teams from across the world to participate in its program that provides funding and support to blockchain startups. The company announced that applications from Africa doubled in this second edition of its program. Nigerian software engineer, Christian Nwamba has been appointed as a Senior Cloud Developer Advocate at Microsoft. Cloud Developer Advocates are meant to engage their developer communities and encourage the use of Microsoft's Azure. Clara Wanjiku Odero, who used to be Head of Implementation at Flutterwave announced yesterday on Twitter that she joined UK-based Rapyd as Director of Network Operations, Africa. Rapyd, a "fintech as a service startup", raised $40 million about a month ago in a series B funding round led by Stripe and General Catalyst, and is expanding into Africa. If you missed the AUDACITY exhibition last weekend, it continues this weekend, March 23 and 24. You don't want to miss a multi-sensory experience that comprises audio and visual components of the Tech Women Lagos portrait series. We've had a lot of cool people over and we've been sharing sneak peeks on social- #TechWomenLagos in case you've somehow missed it. Tech Women Lagos profiles 50 women in Lagos’ technology ecosystem from different backgrounds and at different stages of their tech careers and we are showing the next generation of girls and women that careers in tech are possible and there is space for them in the industry. Apart from the exhibition, there's a line-up of activities you definitely want to be part of (although they are open to only women). 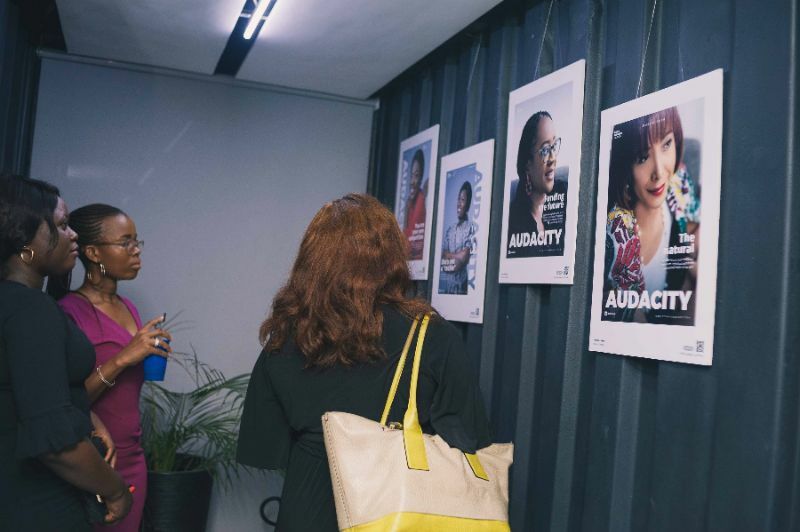 AUDACITY Exhibition Africa Fintech Foundry (AFF), 1216 Ibiyinka Olorunbe, Victoria Island, Lagos March 23-24, 2019 Register to attend Access Bank/W Community Workshop Africa Fintech Foundry (AFF), 1216 Ibiyinka Olorunbe, Victoria Island, Lagos (Registration link coming soon) Andela x Tech Women Lagos Workshop Andela Epic Towers, 235 Ikorodu Road, Lagos Tuesday, March 19, 2019. Register to attend Paystack x Tech Women Lagos Workshop Paystack Offices, 3a Ladoke Akintola Rd, Ikeja GRA, Ikeja Thursday, March 21, 2019 Register to attend Mines.io x Tech Women Lagos Workshop Africa Fintech Foundry, 1216 Ibiyinka Olorunbe, Victoria Island, Lagos Friday, March 23, 2019 Register to attend Flutterwave x Tech Women Lagos Workshop Flutterwave Office, 8 Providence Street, Lekki Phase 1, Lagos Wednesday, March 20, 2019 Register to attend If you'll be at the exhibition this weekend, you should read this. Don't keep this to yourself, share the digest.